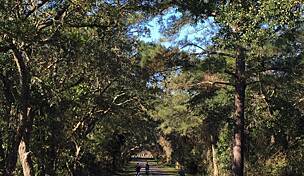 The Swamp Fox Trail is one of South Carolina Lowcountry's oldest trails and offers a long, flat, one-way journey through the swampy wetlands and coastal pine forests of Francis Marion National Forest. 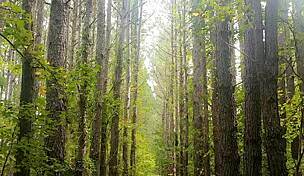 The total length of the trail is 42 miles, but only the eastern 27 miles are designated as a National Recreation Trail. 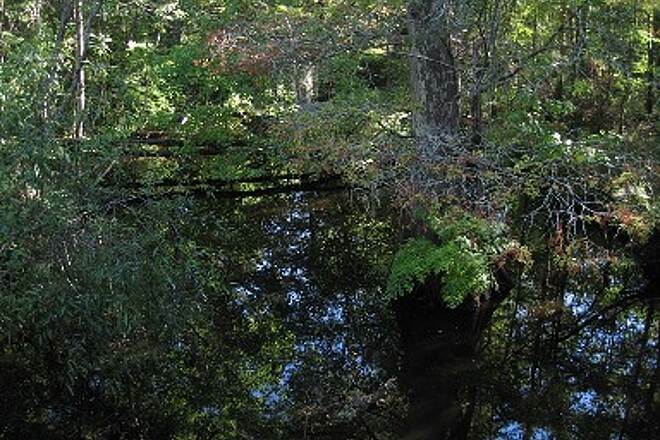 When Revolutionary War General Francis Marion sought refuge from British troops in the state's Lowcountry swamps, he earned the nickname "Swamp Fox." His guerilla tactics and legendary reputation eventually led Boy Scout leaders to name this trail after Marion when it was originally built in 1968. 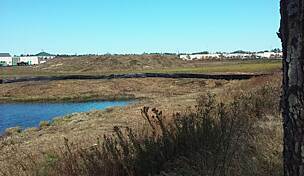 A diverse array of wildlife such as deer, wild turkey, furbearers, songbirds and waterfowl is abundant along the trail. 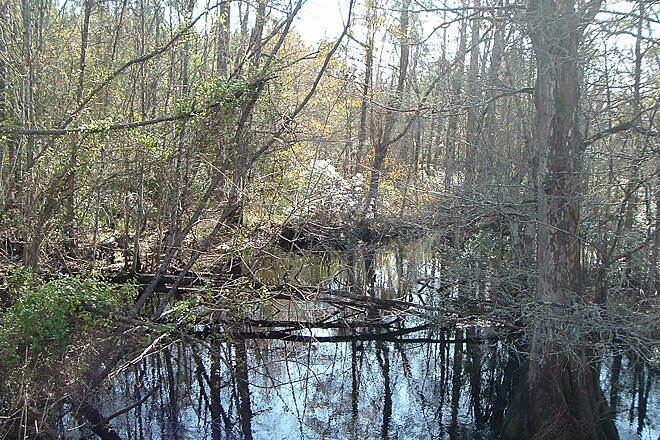 Be aware that after heavy rains the grassy savanna around Dog Swamp and Turkey Creek may have standing water. 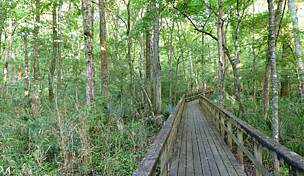 From the southeastern terminus of the Swamp Fox Passage, continue to the coast via the Palmetto Trail-Awendaw Passage. 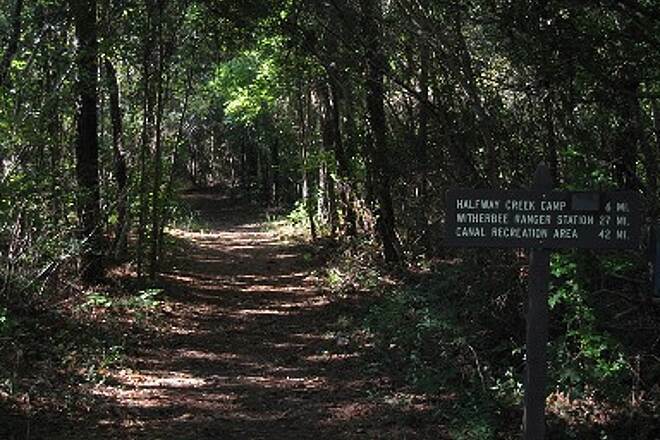 To the eastern trailhead: From Charleston, follow US 17 north to Steed Creek Road (Charleston County S-1032) in Awendaw. Look for the trailhead parking area just beyond Steed Creek Road. To the western trailhead: From Charleston, drive northeast to Mt. 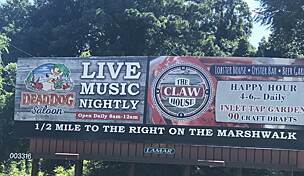 Pleasant and turn left onto SR 41. At Huger, bear left onto SR 402, drive 3 miles and turn right onto Copperhead Road. Drive 2 miles and turn right onto Witherbee Road. The district office and parking area are 0.5 mile on the right. 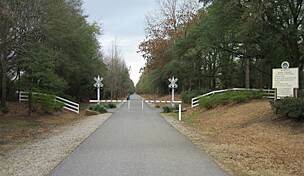 Ran out and back on this 6 mile section of Swamp Fox / Palmetto Trail today. Trail was in great shape and even with a hard rain a few days ago it was 95% dry. 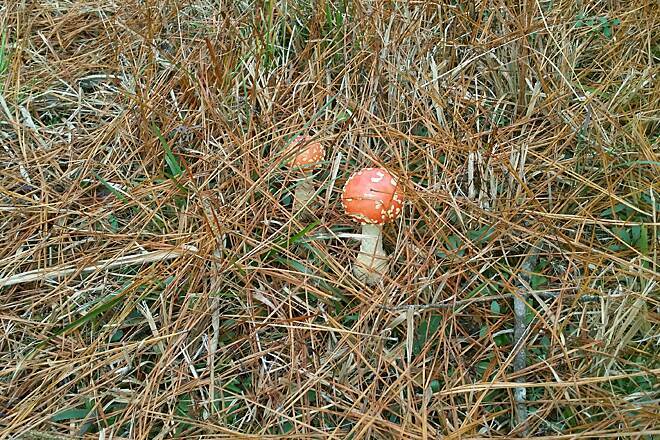 Some hard root packed areas but mostly running on a bed of pine needles. Great way to end 2016! Highly recommend! Though many mountain bikers travel this trail... this is best suited for hikers and trail runners. The trail is flat and fast. I have been from mile 29 (Witherbee Ranger Station) all the way to Highway 17 and Steed Creek Road at the trailhead and this is a fantastic trail to run and spend the day on. 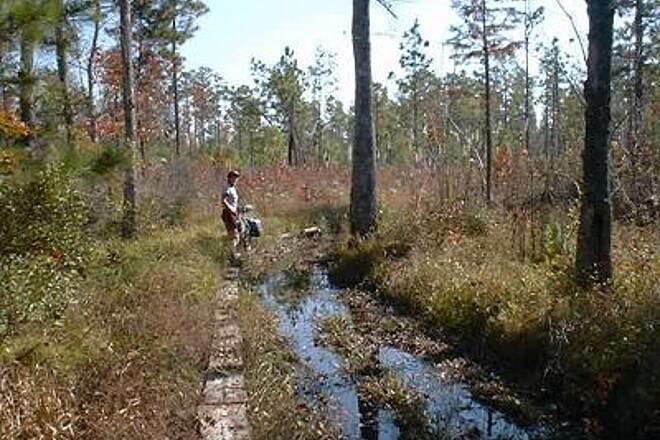 Multiple ecosystems from Carolina Bays to hardwood groves to pine forests...you will encounter it all on this trail. I have seen plenty of deer and wild turkey while running this trail. It is fantastic. 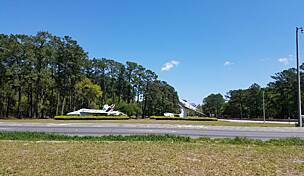 In my quest to traverse N-S on trails only,from Canadian border to Mexican border, it required me to ride the Swamp Fox Trail (SFT) to cover latitudes 33.22124-33.03083. I started at a point where the SFT crosses Halfway Creek Rd. From there I rode the SFT up to Steed Road and back to my car at Half Creek. Then I drove to Steed Creek Rd an rode my bike northwest to N 33.12234 and then back to the car. I did two more sections of the SFT ride covering all degrees latitude. In reading reviews by others below, I am certain they did not ride the same trail I did. Comments of a smooth bike trail are not what I experienced. 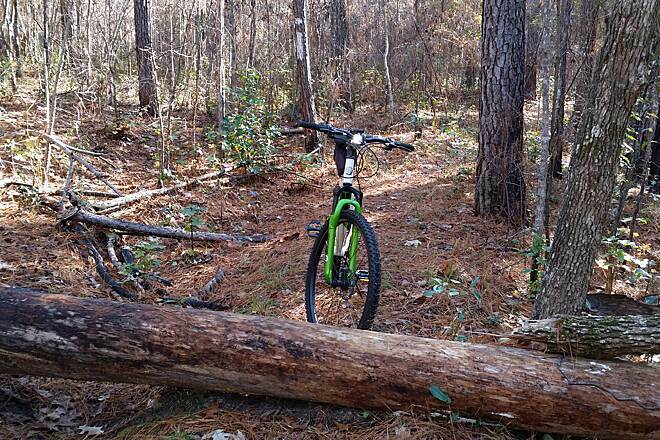 Even though the trail had leaves, pine needles and grass, more than half of the trail I rode was very rough. Tree roots, logs and branches made it a rough ride but I think horses had added an additional bumpy surface. I stopped at the Witherbee Ranger station and talked a ranger highly skilled in MTBing. He said this trail is too rough to classify as an average or moderate MTB trail. So where reviews state the trail is easy or fun, these folks could not have ridden the northwest half of the trail. If you are going to ride the part of the trail I rode, then fat tires, dual suspension and a slow pace must be planned. I averaged just over 4 mph. The good thing is that the trail was dry in mid December and the 40-60 temps with little rain made for a tolerable two day trip. 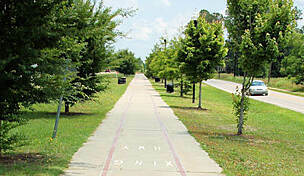 Part of the trail is straight suggesting a rail trail. Minimal elevation change was a plus but the bumps and debris made this trail more difficult than the Blue Ox trail in Minnesota (check my blog traverseusa.blogspot.com ). I rode a 29" Mongoose MTB which seemed to work better than a 26" MTB. In conclusion I would say the northwestern half of the SFT is better for H-hiking than B-biking. I could not find any other trails in the US that covered these latitudes so my 69 yr old body had to suffer and prevail. Good Luck to SFT riders of the future! BTW check YouTube for ExtremeCatfishn's video of the trail. 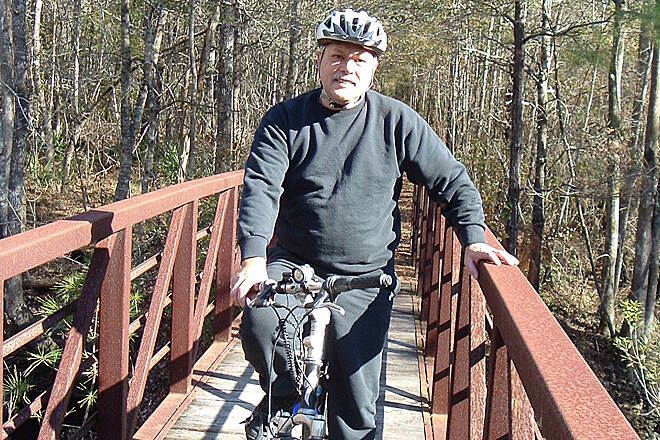 He does a nice job of showing you what to expect as a hiker but not as a biker. 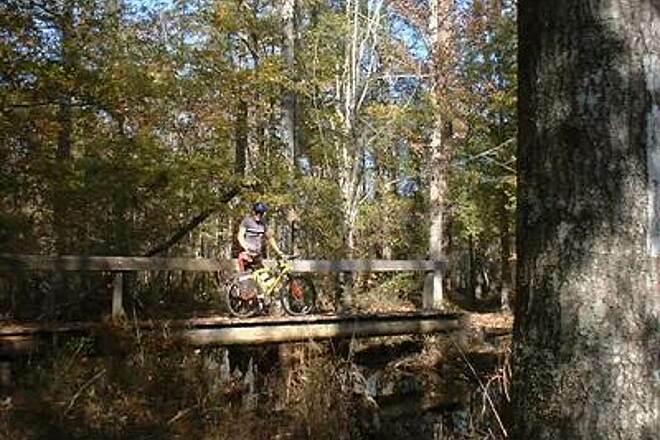 "My wife and I rode the first six miles of the trail on Columbus Day, 2006. It was dry and an excellent mountain bike ride. The trail is grassy and sandy with a lot of roots in some places, so it provides a good workout. The 60° temperature was perfect. On a twelve mile ride, we saw no one else on the trail. Finding the trail is somewhat confusing. As you head northeast out of Awendaw, ignore the Wambaw cycle trail signs. There is a good parking lot about 1/4 mile past Steed Creek Road, but you have to go past it to turn around since it is a four lane parkway. I've submitted a picture of the sign at the parking lot. 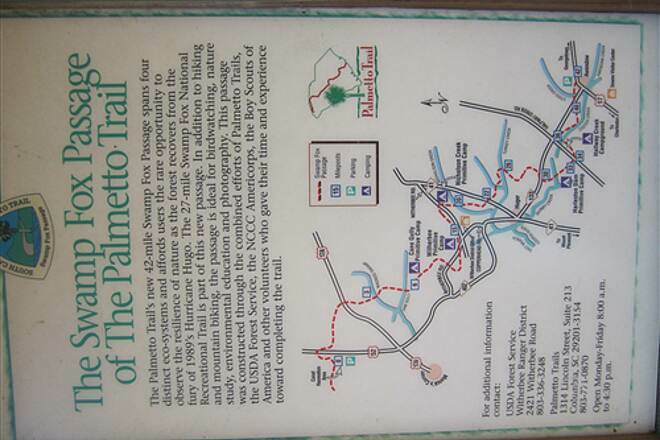 The Palmetto Trail actually begins two miles northeast of here along US 17 at the Buckhall Recreation Area. 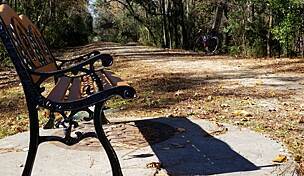 You can avoid the day use fee by parking at the Swamp Fox trailhead near Steed Creek Road. 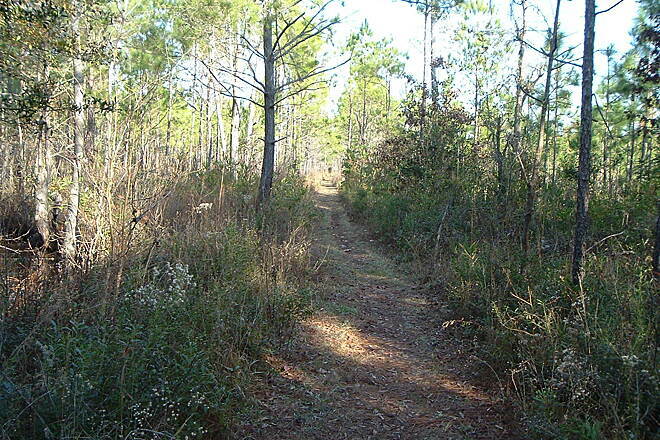 From there, you join the Palmetto Trail about 100 yards into the woods. Just make sure you take the correct turn when you return." 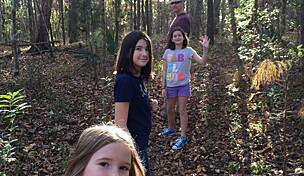 "My husband and I biked from Awendaw to the Halfway Creek Campground on New Year's Day. The trail was just challenging enough to make it like a little adventure, but easy enough to still be fun. There was a little water on the trail, but you could get around it if you didn't want to ride through it and some bridges that were nice. You cross some roads which are hardly traveled. The only problem we had was at one of the road crossing the trail on the other side is not within sight. There was a sign a little way up the road on the right, but it was so shot up with shotgun holes, we couldn't tell that it was a trail sign. So if you are heading west from Awendaw and come to a road with no trail visible on the other side, go to the right. 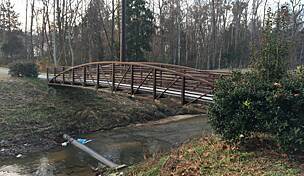 You'll go over a small bridge and the trail is on up the road at the turn. We plan on returning in the furture to ride the rest of the trail. We didn't have any problem with bugs in January, but I can see where this would be a mosquito haven during warm weather." "I did the Hwy 17 to Halfway Creek Camp Ground segment (about 8 miles, 16 round trip) on September 19th. After all of the storms and hurricanes, the trail is in excellent shape. I last did this trail about three years ago, and several bridges have been added, which makes for a better ride. My bike has rockshocks, but my partner's bike did not. He did indicate that his backside was getting sore after about 12 miles. Whoever maintains the trail gets an A+ from me!" 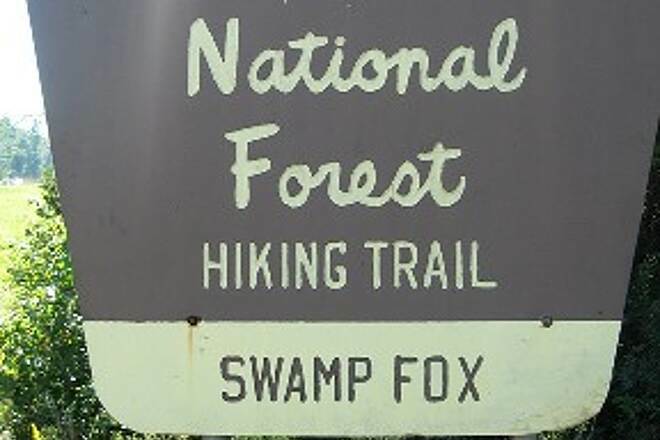 Every May my wife and I do the Swamp Fox Trail. This trail got us back into cycling. It's not too technical. We have ridden this trail when it's both dry and wet. So you get just enough mud and dirt to satisfy you. We have both ridden the trail on ridged frames. Just use fat tires. The bigger tire helps in the sand and when you have to bounce over the rooted sections. All in all it's a very good trail both for the beginner and the seasoned rider. Enjoy! My wife and I biked this trail last winter. We camped near the eastern end of the trail. There was a large encampment of Boy Scouts there to hike a part of it. I found the trail to be slightly bumpy but I ride a dual suspension mountain bike and my wife's bike is a fat tired comfort bike with front shocks and a seat shock. We had no problems -- it is a very nice trail. 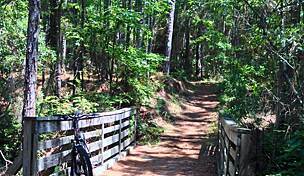 "Swamp Fox Trail outside Charleston, S.C. is for hiking and mountain biking. We thought we'd try it. We're not hard mountain bikers. We have tires on our bikes that are considered cross-trainers but we don't have any shock absorbers. This trail is definitely for mountain bikes. 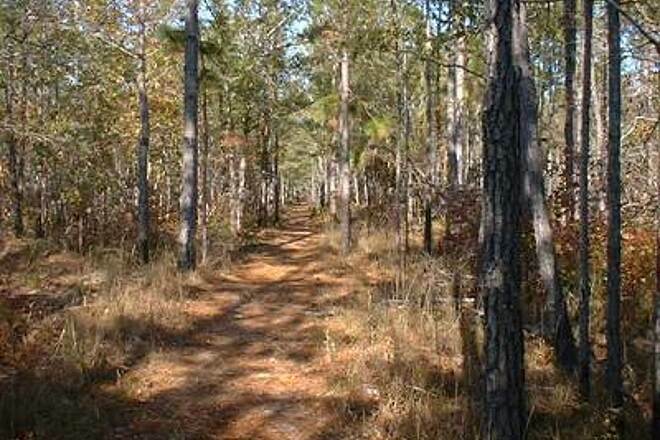 Even though it is in the low country and flat land the trail itself is very bumpy with lots of ruts and holes from tree stumps. We couldn't do much of it because my husband had camera gear that was really getting bounced around but if a person is prepared for a bumpy ride it would be fun. 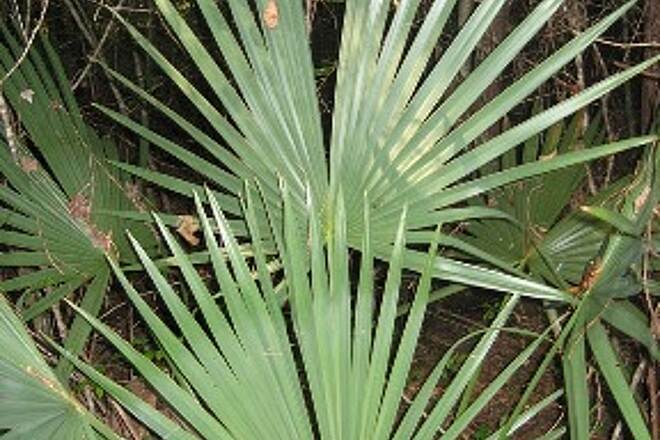 But as they say being in the low country I wouldn't attempt it after April because of the bugs. The mosquitoes will eat you alive! "